5 What am I doing now? I am Master Robin Gallowglass, OP. My persona is a 16th century mercenary. 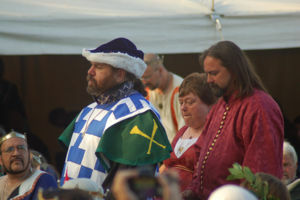 I first joined the SCA in 1981 in the Kingdom of Ansteorra, and my first event was "Field of Cloth of Gold" held in Waxahachie, Texas, south of Dallas, Texas. I am a Mentor Chirurgeon and herald and I dabble in woodworking. I am strongly interested in using the Internet and the World Wide Web to make SCA life easier. I make garb on occasion and enjoy strategy games. I'm a beginner at Viking wire weaving and at Pennsic XXXVII, I learned how to finger loop braid. I was elevated at Mudthaw on March 29th, 2008 by TRM Andreas III and Gabriella. I was totally surprised and caught off guard. 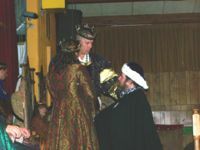 My Pelican, Mu'allim Rabah az-Zafir and his wife came up from Virginia, as did Mistress Olwyn ni Chinneidigh; Master Evan da Collaureo and his wife Lady Alys of Foxdale; Master Herveus d'Ormonde and his wife Mistress Megan O'Donnelly. Metressa Jadwiga Zajaczkowa cooked a wonderful "vigil board" and Lady Sara bas Mordechi made homemade chalah for me. Doña Estrella de los Confinos pulled a "Scotty" and makes me an absolutely wonderful Pelican cloak in under a month, if I remember correctly. Lady Alesia de Maris of Ravenstar made me a gorgeous banner and Mistress Kis Marika (called Mika) makes me a pillow with my arms on it! In April of 2010, I accepted a job offer in Atlanta, GA. I know reside in the Barony of the Southdowns in the Kingdom of Meridies. This page was last edited on 2 November 2017, at 13:01.